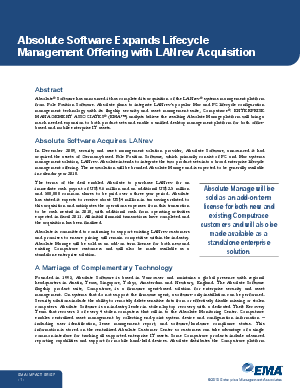 Absolute Software has announced it has completed its acquisition of the LANrev systems management platform. Absolute plans to integrate LANrev's popular Mac and PC lifecycle configuration management technology with its flagship security and asset management suite, Computrace. Enterprise Management Associates explain in this Impact Brief how the resulting Absolute Manage platform brings a much-needed expansion to both product sets and enables a unified desktop management platform for both office-based and mobile enterprise IT assets.